This decadent treat is a must for any holiday candy tray! Very simple ingredients combine to make these rich candies that are dipped in melted chocolate. This recipe freezes well, up to 1 month. Enjoy! Yields: 6 Dozen Time: Allow several hours for these treats, or you can break it up over several days. Let the butter come to room temp by leaving it on the counter for about an hour before you start. Do not microwave it to warm it. Add the butter to a stand mixer or large bowl. Cream together with the milk until smooth, then add the vanilla. Slowly add the confectioners sugar and coconut until entirely incorporated. Form into heaping Tablespoon-size balls, smoothing them in your hands. You may have to cool your hands down by placing them in chilled water before or during the rolling. Place on a wax-paper covered cookie sheet. Don’t worry about the balls touching. Add the balls in to the freezer while you melt or temper the chocolate. Start a double boiler to melt the chocolate. An easy way to do this at home, is to take a medium-size saucepan and fill it about half-full with water. Bring to a low boil, and cover the saucepan with a glass heat-safe bowl. Add the chocolate and the paraffin wax to the bowl. Stir carefully as it starts to melt. It will probably take 20-30 minutes before it is completely melted and smooth. Remove the balls from the freezer. Drop them one-by-one into the melted or tempered chocolate. Use a fork to turn them and make sure they are completely covered. Lift them out of the chocolate and place on a wax paper-covered cookie sheet, making sure they don’t touch. Work quickly so the balls don’t melt in the chocolate. Continue with the rest of the candies. 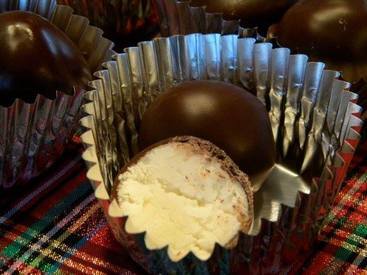 Place the dipped balls back in the freezer to completely harden the chocolate before storing. Store in an airtight container in the fridge for up to 1 month.